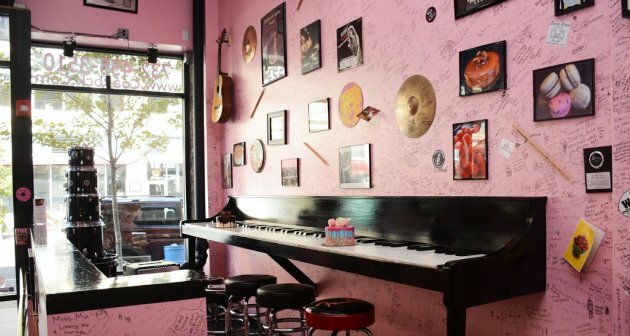 Kimmee Masi never fully realized her musical dreams, but the bakery she opened has made her a rock star in her New Jersey shore community. Editor’s note: This tour of small businesses across the country highlights the imagination, diversity, and resilience of American enterprise. In 1973, Bruce Springsteen released Greetings From Asbury Park, N.J., thus enshrining the shore town in rock’s pantheon. That same year, The Stone Pony opened there. “The Boss,” Southside Johnny & the Asbury Jukes, Bon Jovi, and many other Jersey rockers passed through the club’s doors on their way to glory. A year later, in nearby Freehold, 4-year-old Kimmee Masi found among her Christmas presents a drum. The gift launched Masi on a road that would one day bring her to the stage of the Stone Pony with her band Our Last Sin. When the rock star dream fizzled, Masi stayed part of the Asbury Park scene in the best way left to her: She opened a music-themed bakery. At first, products conveyed the music theme through cake toppers with guitars and band logos. “But that was too easy,” says Masi. Now, every cupcake, cookie, and bun on the business’s “set list” has its own groan-inducing musical name. oREO Speedwagon. SugaRUSH. Smashing Pumpkin. Macaroon 5. Just three blocks from the beach, Confections of a Rock$tar draws up to 400 customers a day in summer, when tourists flock to a region made notorious by a certain reality show. (Jersey Shore was filmed in Seaside Heights, half an hour away.) Customers have included that program’s Nicole (“Snooki”) Polizzi and Deena Nicole Cortese, as well as cast members from Mob Wives and The Real Housewives of New Jersey. In fact, reality television has played an outsize role in Confections’ history. The bakery’s painful birth was chronicled in a 2012 episode of 3 Days to Open, a Food Network program in which celebrity chef Bobby Flay swoops in to rescue out-of-their-depth entrepreneurs. “People say even bad publicity is good publicity,” says Masi, who has moved on from that episode both professionally and emotionally. Today, Confections of a Rock$tar is a popular stop for Asbury Park residents and tourists. 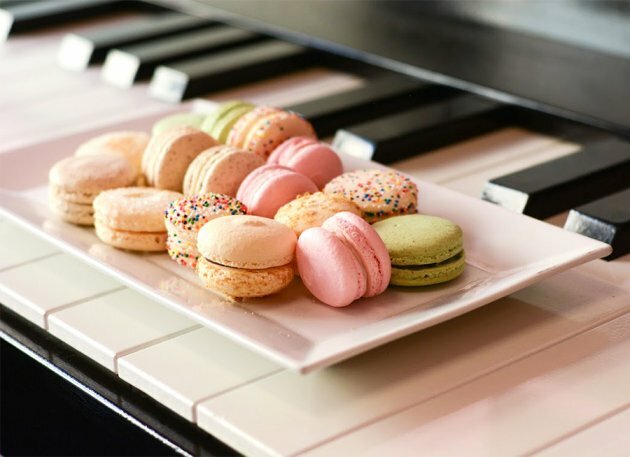 Local and visiting bands–including Uncle Kracker, Third Eye Blind, and Black Label Society–have ordered cakes for events. Bon Jovi keyboardist Brian Adams has been a customer. Masi’s youthful memories are disjointed thanks to a 1994 car crash that broke her neck in two places. She endured grueling physical therapy and had to relearn to read and to add. “I survived on sticky notes throughout the house that would remind me not to put the ice cream in the oven,” she says. Even if Masi’s recollection is hazy, she knows the basic facts. She grew up in Freehold, where her father taught pastry making at a vocational school and then, in 1977, opened his own bakery: Vincent’s Cookie Cupboard. That business, which expanded to a second store, became her hangout because she loved to bake. Mostly, though, because she loved her dad. As a teenager, Masi had everything figured out. She was going to be a rock star. Later, she would open a bakery. She prepared for both professions at once. Starting in high school Masi took jobs in the kitchens at Food Town, Dunkin’ Donuts, Shop Rite, Grand Union, Manhattan Bagels–anyplace she could dig down into dough. She learned to decorate cakes and boil bagels. Meanwhile, an early band she played with was building a local reputation. Eschewing college, Masi worked multiple jobs, still baking, still drumming. Then: the crash. After several years, she healed enough to work again, although it would take longer before she could pick up the drumsticks. Location, for Masi, was nonnegotiable. It had to be Asbury Park, where she had listened to and played music for decades. She and her partner budgeted a little over $150,000 to open, with most of that coming from Lasky. The final cost approached $250,000 after mounting problems with the build-out. In true reality show fashion, 3 Days to Open exulted in the turmoil. Over scenes of crumbling cupcakes and tins of product being dumped in the trash, Bobby Flay intoned: “With no professional baking experience, low-quality ingredients, faulty equipment, and a staff with zero baking skills, they need my expertise.” Masi, in the early going, was profane, distraught, angry. Some viewers reacted poorly. Five years into the business, Masi and Lasky are looking to expand Confections. They are shifting production and their cake consulting service to a facility seven miles away, from which they will also run mail order. That frees up much needed retail space: hopefully enough to include a portable stage for performances. (The bakery already hosts acoustic acts.) Long term, Masi wants to open locations in other music-centric cities, including Cincinnati, Memphis, Nashville, and Austin.